We understand and utilize different materials and techniques to complete the job to the best of our ability. We will complete the job based on the specs provided and make sure to live up to the customer's expectations. Rodeco has the capability to meet your specific blast cleaning requirements, including stringent requirements for customers in the aerospace and firearms industries. At our facility, we use various equipment such as wheel/shot blast, suction blast, pressure blast and more. When you choose blast cleaning from Rodeco, you're choosing our experience. 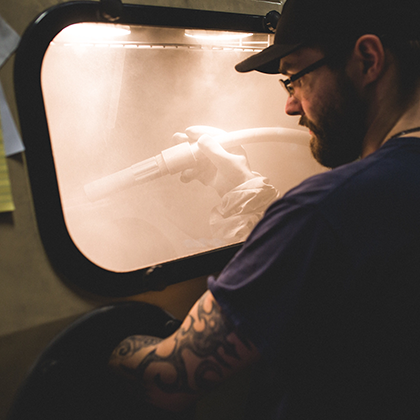 We have the knowledge and skills to get you the perfect finish every time. The high operating costs needed for mass finishing can be daunting, so we worry about it for you. We know the right media and the right machines to get the job done right. Rodeco has been ISO 9001:2015 since 2004 and has met cleanliness standards for Robert Bosch brake and airbag parts. Save your company’s capital dollars for something else. No capital dollars are needed when the finishing work is done at Rodeco! Rodeco has the ability to set up inside your facility and perform mass finishing on a price-per-parts basis. Rodeco handles spikes in your production without overtime, meaning less stress for you. Rodeco charges on a per-piece basis, meaning costs will always be consistent. Rodeco’s Job Shop has helped some of our customers with descaling, rust removal, cleaning, brightening, and deburring of their parts. Parts can be made from aluminum, brass, steel, stainless steel, plastic, copper and cast iron, and include silverware, gold and silver jewelry, ceramic tiles and porcelain. Let our experience and production be the partner you can count on. Empire Air Blast Rust Removal from Kevin Umphreyville on Vimeo. Empire Suction Blast Video - Glass Bead and Allox from Kevin Umphreyville on Vimeo. Polishing Wheels - CLM Vibe-Tech High Frequency Finisher from Kevin Umphreyville on Vimeo. Heavy Coating Removal - Suction vs Pressure Blasting from Kevin Umphreyville on Vimeo.